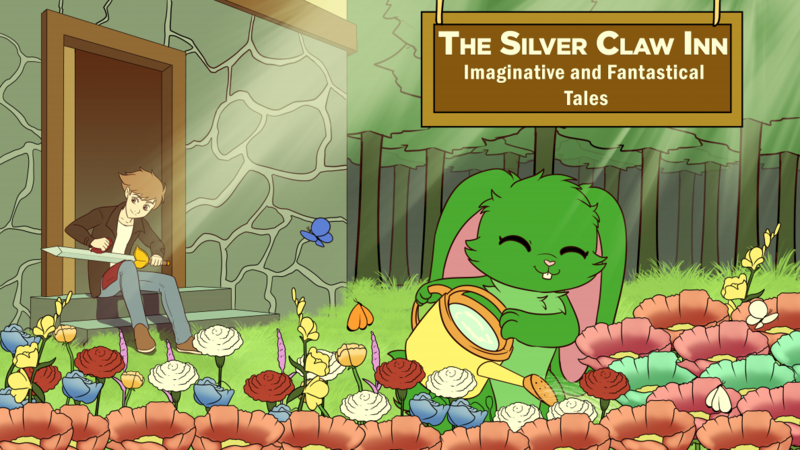 Join The Silver Claw Inn Newsletter and get mini-progress updates and previews to upcoming works. I may even throw a mini-story or two featuring my characters above. Who knows? Don’t forget, the inn is always open. Time for some strange and creepy tales. Hope you’re not a weenie. Today’s novel is actually a short story anthology. It’s Check Out The Library Weenies, by David Lubar. You can find it here. I’ve had a love for this author for a long time and am always fascinated by an author having just as strange of a mind as mine. In fact, he’s the reason I became an author to begin with. But it’s the halloween season, so I figured I’d share a little spookyness and showcase a few stories I enjoyed out of this. And believe me. I enjoyed pretty much a good portion of this book. But I don’t want to review everything for the sake of time, so I’ll review a few that stand out. What’s a fantasy website without a fantasy story. This one is about a kid who seeks the aid of a wizard who can transmute things into silver. In reality, he’s a werewolf who seeks revenge on a hunter who is after his kind. I enjoy this story a lot because it feels like something I’d read in a magazine like F&SF. You don’t even get the idea he’s a werewolf until later and it does it in a very convincing way. The kid implying he needs silver is innocuous enough, but I love the set up to the fateful battle. And it’s short and creepy enough that it works. This does house some weird stories, but this story is why I love Mr. Lubar so much. It’s the kind of stuff I’d make, even if I wanted to make the kid and adult, it’d still be something that I love. I do feel that the wizard shrugging it off and giving him the silver was a bit presumptuous, considering he used it for hunting. I felt he should have worked a bit with him (maybe for money) and then used it. Also, it does feel like using something for personal gain, but these stories don’t often have happy or even good morals. And that’s because none of these stories are meant to be life lessons. They’re goofy, creepy, and odd tales that make you curious and wonder about some people. It doesn’t have to teach anything (most of these stories aren’t exactly life lessons), but I want to have fun and read a whimsical and odd tale. Speaking of one of a kind stories, this one is about a girl who went under chemotherapy due to having cancer and thus, made her bald. Naturally, the kids mock her, but once the students cheered her up by making her bald, she feels less alone. Also, the bullies are hounded by bats, since they’re the only ones with hair, and end up bald as revenge. I loved this story. In addition to being on the more natural side, I can easily see this in a magazine somewhere. It’s simple, effective, and humorous as well. The idea of a cancer patient is a good way to show similar kids that they’re not alone. It’s easy to make fun of bald women (though Okoye from Black Panther is an example of being a bald badass lady), but this story should be a read for those who have gone through similar messes. Plus, the whole school was helping her out after being bullied. That’s what more schools need. Camaraderie and sticking together. Not only would it make schools better, but it’d inspire us as well. In this day and age, people are being more conscious about their jokes and insults, but this is a good example of representation handled well. A genuinely creepy tale no doubt ready to frighten kids. It’s about a girl who has to stay with her aunt because her mother has to go on a business trip. Inside are wall to wall doll heads that look as creepy as you imagine them. She’s forced to stay six nights, but when one head tries to bite her, the terror jumps. She must survive the night while sleeping with chattering doll heads waiting to attack her. I loved this story and it truly gave me the chills. As an aside, I’d advise against reading this to your kid at bed time. This is an example of true fear and even if I read it at night, they’re not easy to go through. It feels like it came straight out of Goosebumps. I’m sure this series was no doubt inspired by them, but I love the idea of these horrific and scary tales intermixed with happy-go-lucky silliness that’s guaranteed to send the reader in another direction in this strange and unusual anthology. This had a genuine display of twists that keep you guessing at every turn. The kids all had conflicting motives and when it seems like it was headed in one direction, the other path pops up and throws you in a loop. That said, I feel that while it could have ended with the two allying, the ending itself was a bit of a betrayal, kind of like the characters betraying each other. Either way, I felt it would have been amazing had the kid worked with the dragon to off his “friends” and ride off together. The kid did seem a bit cold. They were his friends after all. Perhaps if he were trapped with a few bullies, this would have been more satisfying. This story I had mixed thoughts about reading it. It’s about a mother and her daughter going to a Black Friday sale, and discussing all the madness that occurs. She basically trains her for the day when she’d have to handle this herself, and inevitably, they get what they need by beating the crap out of a rude guy who didn’t deserve it. On the one hand, this is a gloriously absurd story that is not only goofy, but feels like a cartoon as well. People are super violent, as Black Friday often is, and it’s basically a brawl to get what you need. Also, it was clear that these two were a bit psychopathic in their own ways, and that’s also a theme. Some kids are clearly too cruel for their own good or too naive to survive. This is the type of book where anything goes. Good, bad, wacky, horrifying, odd, normal, it all exists in these stories. I guess the more I think about it, not every story is treated as some sort of endearing lesson and is meant to either entertain or be creepy in its own way. It’s as neutral as it can be, neither going one way or the other. That’s all for today. Take care, don’t be a weenie, and remember, the inn is always open. If you have any suggestions for future topics and reviews, hit me up on my social media channels and let me know your thoughts. I always read the feedback, even if I don’t respond. Your feedback is what keeps me going, so thank you for supporting me. My Japanese Mythology-inspired short story, Do Not Stare Into The Eyes Of A Kitsune, is finally available. You can buy it on Amazon or wherever ebooks are sold. Help a debut author make his debut worth it. I posted a preview of my newest Short Novel, City Of Kaiju. A tale of sacrifice, trust, and companionship in the midst of a Kaiju invasion. See a preview here. Posted on October 5, 2018 October 19, 2018 by Steven CapobiancoPosted in Fiction FridayTagged David Lubar, Fantasy, Fiction, Fiction Friday, October, October 2018, Review, Short Story, stories, storytelling, Weenies.